Even with daily brushing and flossing, there are still some things we miss in our at-home oral care routine, especially around orthodontic brackets. Plaque becomes harder to remove when it builds up and eventually becomes tartar. Tartar can only be removed with professional tools and is intensely hard to get rid of. Cavities form when leftover tartar erodes the tooth, creating holes. The only way to fix this is to have them filled. With regular cleanings, cavities, plaque, and tartar can all be treated or avoided altogether. 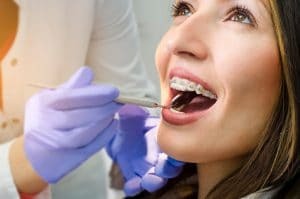 At McNamara Orthodontics, we check each patient at every visit for good oral hygiene habits, but once orthodontic treatment is completed, maintaining regular dental checkups and cleanings is important over the long term. At McNamara Orthodontics in Ann Arbor MI, we specialize in the development of jaws and movement of teeth. Your general dentist can help identify oral cancer, serious oral infections, treat the buildup of plaque and tartar and other issues caused by bad habits and poor oral hygiene. Do yourself a favor and schedule your next check-up as soon as possible if it has been some time.